The baudline signal analyzer is a scientific visualization tool that is made by User:SigBlips. It is a free X11 based software application that runs on many Unix operating systems including FreeBSD, Linux, Mac OS X, and Solaris. Baudline uses the standard input file descriptor to stream in and collect the quadrature setiQuest Data. Many DSP operators and transforms including Autocorrelation can be used to analyze the data in real-time. Baudline has various display windows for visualizing the data and numerous tools for making accurate measurements. The Play Deck can be used to listen to the signal and apply a variety of audio effects and filters. 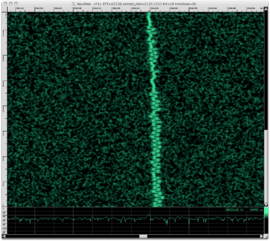 Baudline can also be remote X11 displayed over a network natively or with ssh -X.
Baudline was the first third-party (non-SETI Institute) software to analyze the setiQuest data back in April 2010. Baudline was the first to discover the Kepler-exo4 FSK signal, measure it, and demodulate it..
Baudline was the first app to find and measure the Voyager probe's drifting weak signal. 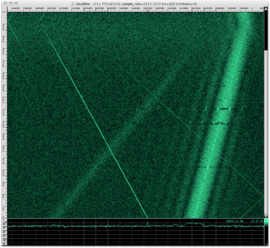 Baudline was the first to look at and analyze the entire 4 TB setiQuest data archive.